Dunlop MXR M-84 Bass Fuzz DeluxeNext up in the award-winning MXR Bass Innovations line is the Bass Fuzz Deluxe. We dug up a rare vintage fuzz and modified it for the modern bassist. The resulting stompbox delivers a cutting and bold fuzz tone without degrading the punch and clarity of your original signal.With separate Dry and Wet level controls, the Bass Fuzz Deluxe sounds like youre running two different amps. Blend to taste, from subtle hairiness to full on raging fuzz, with Fuzz and Tone controls affecting only the Wet signal. 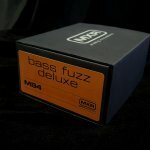 The Bass Fuzz Deluxe features true hardwire bypass.